Manchester United are keen to sign West Ham striker Marko Arnautovic in January as Jose Mourinho looks to reinvigorate his side’s push for a top four finish. The Red Devils find themselves off the pace in the Premier League with Saturday’s 0-0 draw at home to Crystal Palace leaving them seven points behind fourth-placed Chelsea. Mourinho’s attacking players are also finding goals hard to come by with talisman Romelu Lukaku failing to score at Old Trafford for 238 days and the likes of Marcus Rashford and Alexis Sanchez struggling to impress. Now, according to The Mirror, Mourinho is set to launch a January bid of more than £50million for the imposing Austrian forward. West Ham are wary of the growing interest in their prized asset as clubs continue to be spoken to by his representatives. He has been on United’s list of potential offensive targets since the end of last season but his estimated value, age and maverick character are all against him. Arnautovic’s brother and agent, Daniel, was widely quoted last week as having Everton and Chelsea both interested but they all have similar reservations. 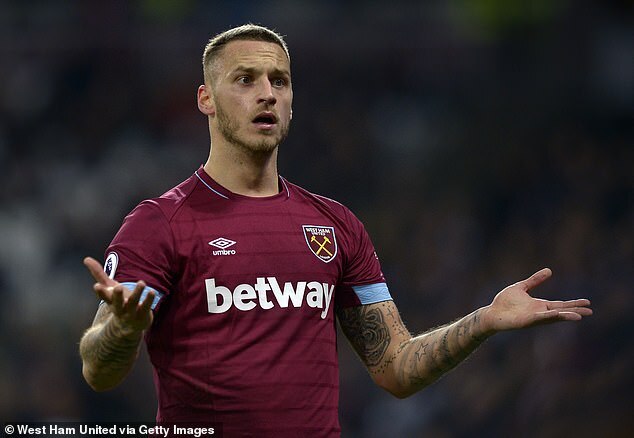 West Ham boss Manuel Pellegrini is adamant he does not want to lose Arnautovic, who has scored five goals in 12 appearances this season, in the near future. United are showing more interest in West Ham defender Issa Diop, the talented young French defender signed in the summer from Toulouse. Mourinho is keen to bolster his defensive options and the 21-year-old could provide a long term solution to the problem. The Portuguese has already spoken highly of Diop this season. After West Ham’s 3-1 win over United in September, Mourinho said: ‘(He had a) fantastic match.